Hello again!!! I'm so happy to see you back here today. Today, I get to share one of my most favorite projects I created for this release. A special gift for a teacher at the school...and it's a home decor item! Well, actually, it's more like a class decor item. Wherever she chooses to hang it really! All of the images are from one of the new sets being peeked today, Faith in Bloom. 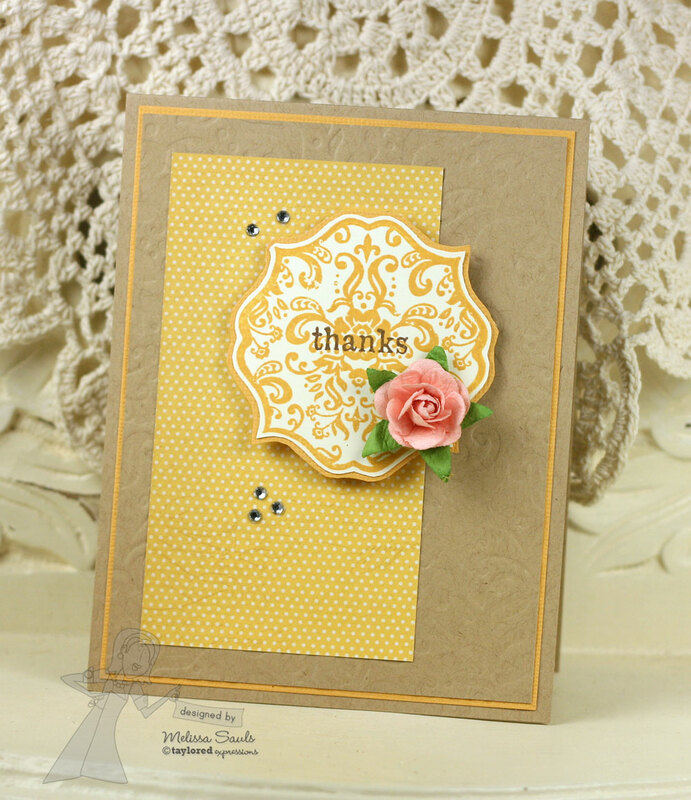 This set was illustrated by Emily Burger for her Embracing Grace line of stamps, and it features Bible verses and words of encouragement, along side some cute and quirky blooms. I had so much fun putting this together!! 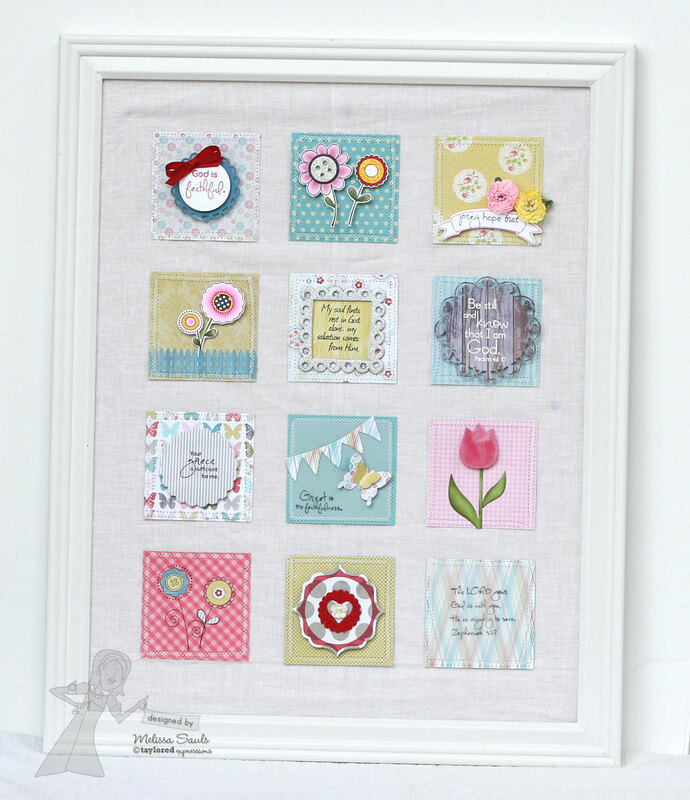 I found my inspiration from a framed piece through Pinterest, which was linked back to 2 Peas HERE. I bought a really large frame... 14" x 18" cheap over at Michael's! I lined the frame with a layer of bleached muslin cloth and then cut these squares into 3" x 3" pieces from the MME Miss Caroline Dolled Up line of paper. I also used a whole mess of Taylored Dies on my projects! 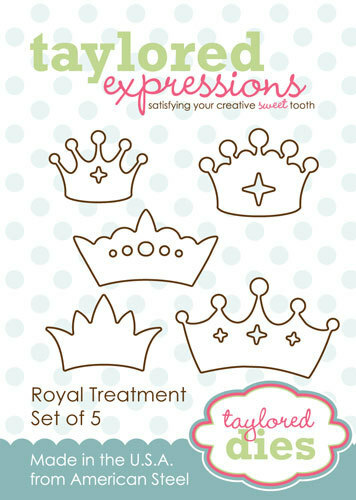 I also made one more project for today...featuring the new Royal Treatment Crowns Dies. I thought, for my card, that it would be fun to use the negative image that the die leaves behind. Sometimes, that just adds a fun and different dimension to a card, right? :) I just took a piece of the blue cardstock and used the Musical Swirls Impression Plate to make a textured background. I then used the Medium Doily Die to cut out a piece of paper from MME Lost & Found Blush papers. 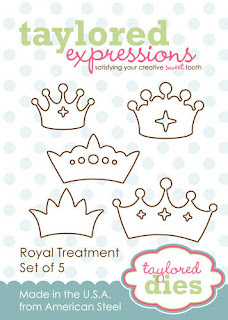 The stamp is from the other newly releasing stamp set, Royal Digs. I accented the top of the crown with tiny blue rhinestones from the Multicolored Taylor's Twinkles. And that is all for me today!!! I hope you will hop around to see what the rest of the Baker's have created for you today...there will be lots more to see! Thanks for visiting and I look forward to seeing you back tomorrow for the big release! Ahhhh...isn't she gorgeous?!?! 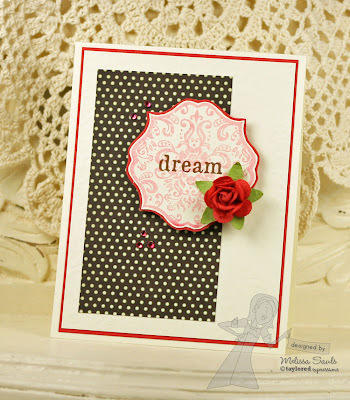 This little lovely was designed by our very own Nancy McKinney with her Moka line of stamps. 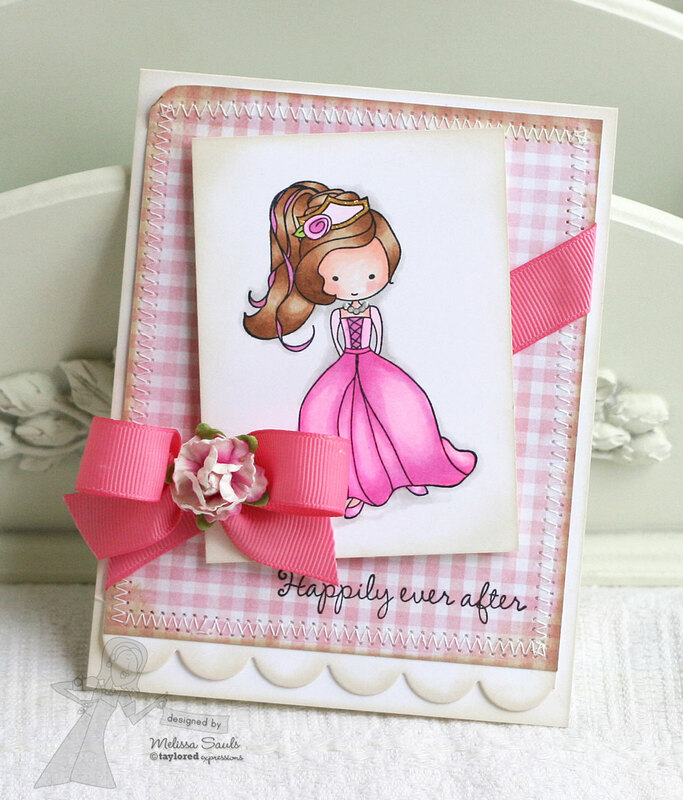 As always, all of the stamps are pre-cut on deeply etched rubber (in a cute shade of pink! ), mounted to EZ Mount and ready for your acrylic blocks. These Mokas are sooo cute and so fun to color in with Copics! 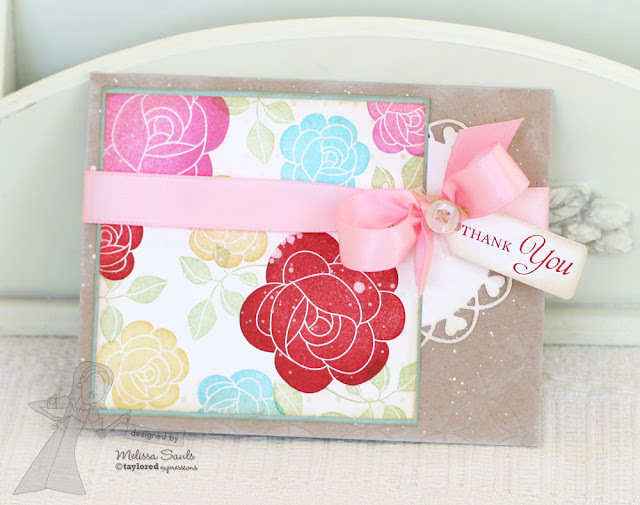 The patterned paper came from MME Lost & Found Blush. Definitely one of my favorite projects this release. :) And look...sooo simple to make! Ready to be off to see more? Enjoy!!!! 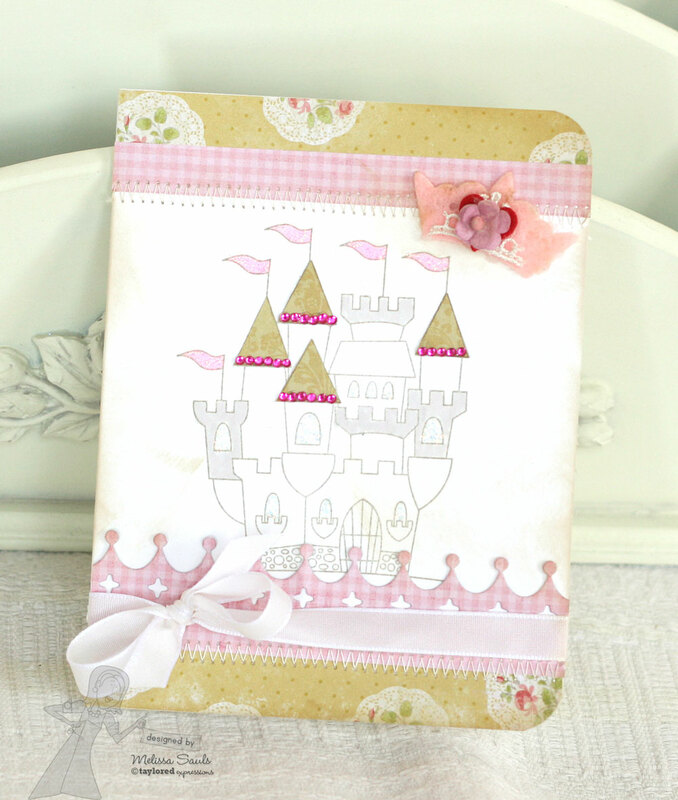 Now, be sure and hop around to see even more sneaks...and the other Adorable Abode! Hey everyone! 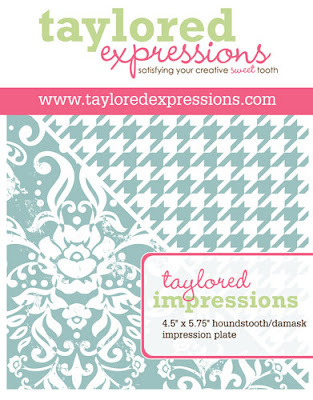 Have you seen the latest Taylored Expressions Sketch Challenge?? It is CRAZY!! I just had to play along. :) Can you see how I totally followed the sketch to a "T??" lol! And here is the original sketch to follow.. 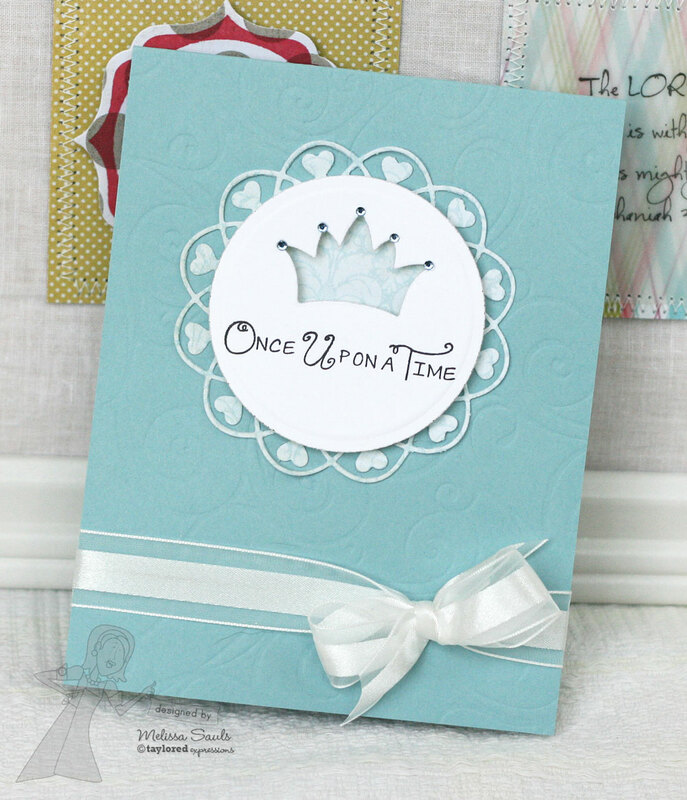 I used an oldie but goodie set, CreativiTEA...such a gorgeous set with beautiful images and fonts. :) And, of course, I couldn't resist using some of the new MME papers now available in the TE store...this one is from the Miss Caroline Fiddlesticks line. I don't use purple enough, and I actually really love it on cards. Rare color seen, right?? Also, I will be back here in a couple of days for some TE sneak peeks for the March release!! Hey everyone! So sorry for my disappearance again. With the semester back in full swing, I'm back to being swamped with the studies. Physiology is MUCH more intense than Anatomy...just FYI!! 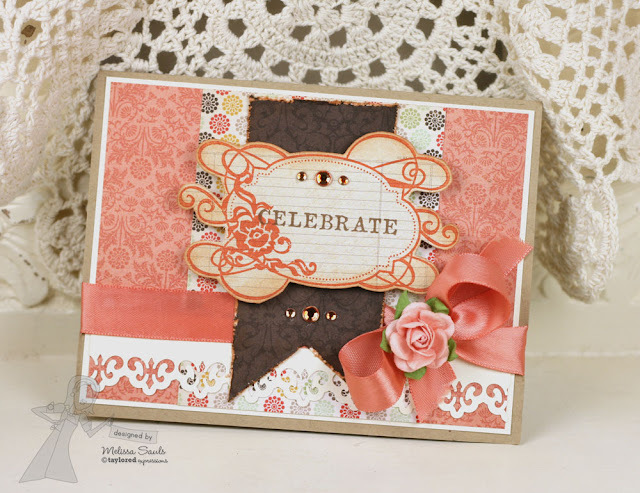 Anyway, I took a little time to play with last Wednesday's sketch challenge over at Splitcoast, AND I wanted to use one of Taylored Expressions newest stamp sets that I haven't stamped with yet, but just ADORE...Rosy Posey! 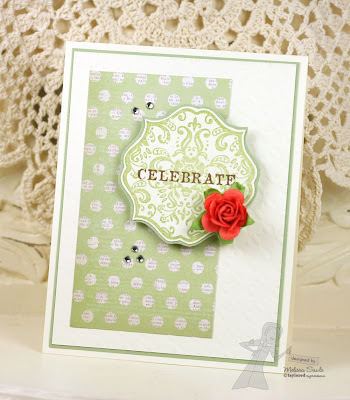 I created this little number using the latest Taylored Expressions Sketch Challenge! There is a chance to win something just for playing, so make sure to read just how you can win on Taylor's blog HERE! I just love this kit...and really, I love every kit that has come out. 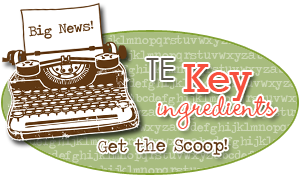 You can see the ones from previous months just by looking at the history on the Key Ingredient blog. It is such a great value AND a great convenience! All the shopping and accessorizing already done for you! So Wanda Guess is playing with me today...along with the Key Ingredients blog, so make sure to check them out for even more inspiration today! Key Ingredients Info and Inspiration - February 10-15 - learn all about this fantastic kit club and see samples from the Key Ingredients Design Team and the Baker's Dozen! Click here for all the info and start at Taylor's blog each day for all the inspiration. 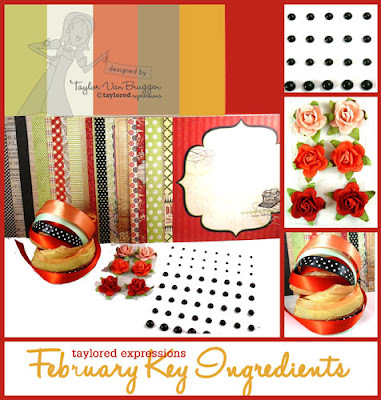 February Key Ingredients featuring My Mind's Eye Lost & Found - Rosy begins shipping February 15th. Enroll now! 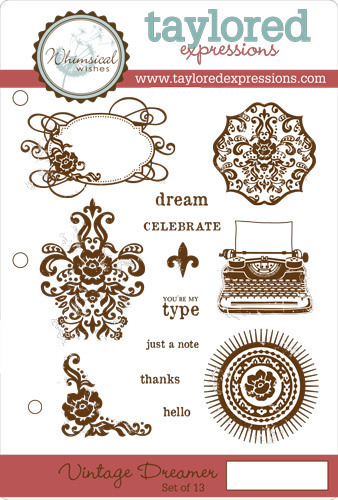 Exclusive Vintage Dreamer Stamp Set - find out how you can get your crafty little hands on this stylish new set at 50% off for a limited time! Win a Key Ingredients Kit - you can win the March Kit to try out, or have a month added on to your current subscription. See Taylor's blog for all the details and to enter to win! It's easy! Hello everyone! 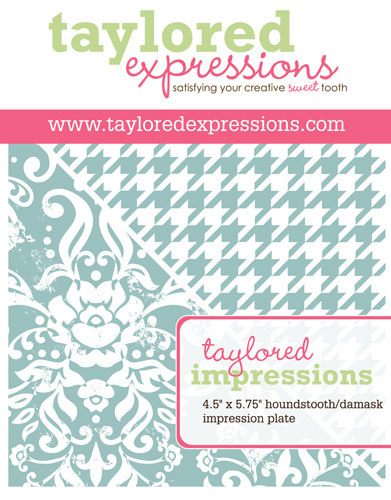 Things are still shaking over at Taylored Expressions, and we all have a special mid-month release to sneak for you that coincides with this month's Key Ingredients! If you aren't very familiar with the Key Ingredients, in a nutshell, it's like a fabulous kit club! You sign up, and for an affordable monthly fee, you receive in your mailbox, all the papers, patterned papers, ribbons, and fun accessories to create your own projects...cards, scrapbook pages or otherwise! 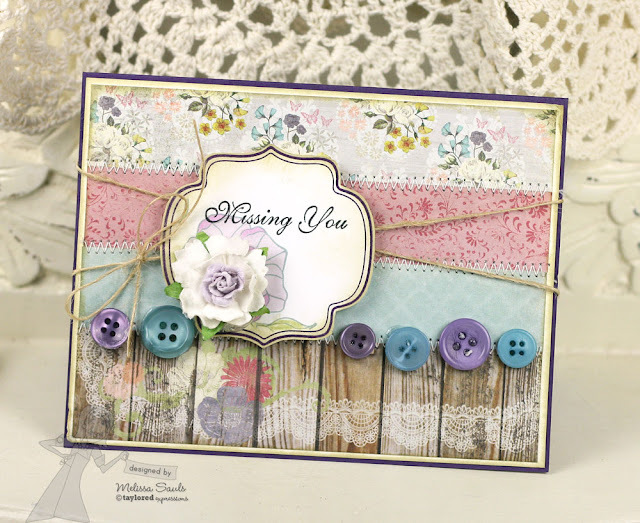 Of course, there is always gorgeous inspiration provided for you by the uber talented Key Ingredients team to keep your creative juices flowing on just what you can do with each month's kit! So let's just dive right in, shall we?? 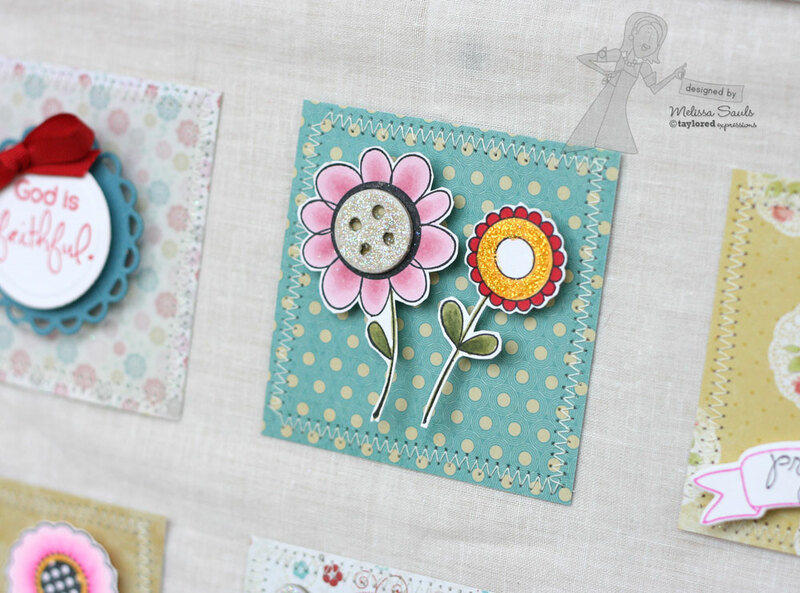 I created a group of 3 cards that are sooo easily mass produced, using elements from this month's Key Ingredients. I used a special set, called Vintage Dreamer, that will be available exclusively for Key Ingredients member, so now is your chance to sign up and get it for 50% off! I hope you enjoyed what you have seen...3 variations on easily mass producible cards using items from the kit...very fun and easy!! Please be sure and stop by the following ladys' blogs to see even more inspiration!